Have you ever had a craving for blueberry pancakes and hot queso at 4 AM in the morning? In most cities, you would be out of luck. But in Austin, you have Kerbey Lane Cafe. 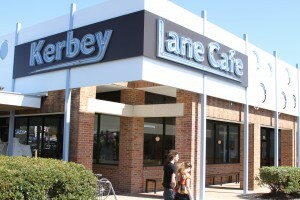 From humble beginnings to word-of-mouth wonder, Kerbey Lane Cafe opened in May 1980. The owners, Patricia Atkinson and David Ayer, lived in the back of a little house on Kerbey Lane. The front of the house birthed what has become an icon in the Austin restaurants scene. There are five locations in the Austin area, but we had the privilege of the visiting the newest location at 3003 S. Lamar. Karli Isiyel met at us at S. Lamar and gave us a bird’s eye view of Kerbey Lane’s history, achievements and goals that most casual visitors never get to see. Karli, a roller derby enthusiast and native Austinite, is the Marketing Coordinator for all of the Kerbey Lane Cafe locations. We also got to meet Ben Wintle, who you’ve talked to if you’ve ever interacted with Kerbey Lane Cafe on Facebook, Twitter or any of the other social networks. When Ben isn’t working at Kerbey’s S. Lamar location, waiting tables and doing his part to make customers’ culinary dreams come true, he’s talking about it online! When I read a tweet like, “Have we told y’all lately that we love y’all? We do. So much.” from @kerbeylanecafe, I believe it. I feel a welcome and warmth whenever I step into a Kerbey dining room and Ben verbalizes it well. The Austin community has shown love for Kerbey Lane for almost 32 years, and Kerbey’s 400 employees show the love right back. On an annual basis, the real people behind Kerbey Lane Cafe take part in the Mighty Texas Dog Walk and Keep Austin Beautiful. They also have monthly donation drives and give to local charities such as the Capital Area Food Bank. In April, they will be supporting the National Alliance on Mental Illness. Talk about giving back to the community! 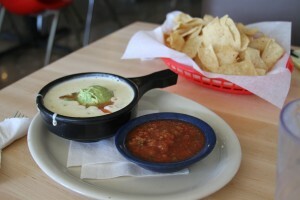 The signature Kerbey dishes are the Kerbey Queso and pancakes. When we visited, there were seven (count them – seven!) pancake options on the menu: buttermilk, gingerbread, apple whole wheat, blueberry, blackberry (the daily special), daily vegan and pumpkin (seasonal). Austinot Eric ordered the blueberry, and I had the blackberry. Neither of us were disappointed! In addition to some amazing breakfast food, there are delicious and unique lunch and dinner entrees. Try a Pear and Bacon Panini, or the Wild Boar and Bison Chili Frito Pie. I did say unique, didn’t I?! Stuck in the office? Contact Kerbey’s catering service for 24-hour yummy-ness. Yearning for a taste of Spring? Kerbey’s Spring seasonal menu comes out at dinnertime on March 28th. See? They have you all taken care of. 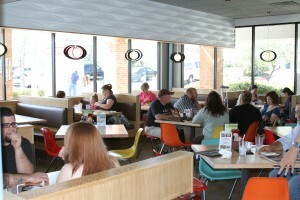 Stop by the new location on South Lamar and give Kerbey Lane Cafe a try, and tell them the Austinot sent you! 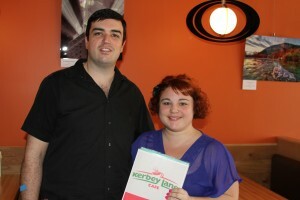 Have you been to Kerbey Lane Cafe? What is your favorite dish?